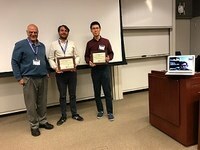 Researchers of CWI's Database Architecture group have been awarded with a best paper runner up award at 29th International Conference on Scientific and Statistical Database Management (SSDBM 2017) in Chicago. The researchers received the award for their paper 'Multi Hypothesis CSV-parsing' by authors Till Döhmen, Hannes Mühleisen and Peter Boncz. Op 25 april 2017 lanceren CWI en het big data analyse- en data science software-bedrijf Databricks een nieuwe samenwerking. Dat gebeurt bij de Hannover Messe, in aanwezigheid van Minister Kamp van Economische Zaken.